Hey guys! How cute are these monogrammed, Christmas pajamas?! They are from shopilovejewelry.com, and they are only $21.95 as part of their November “MonoBox”! I’m wearing the Small, and the fuzzy socks are also included! It also came with a cute Christmas ornament. 🙂 I love that the material is buttery soft, you can’t see though them, and they have a very comfy fit! 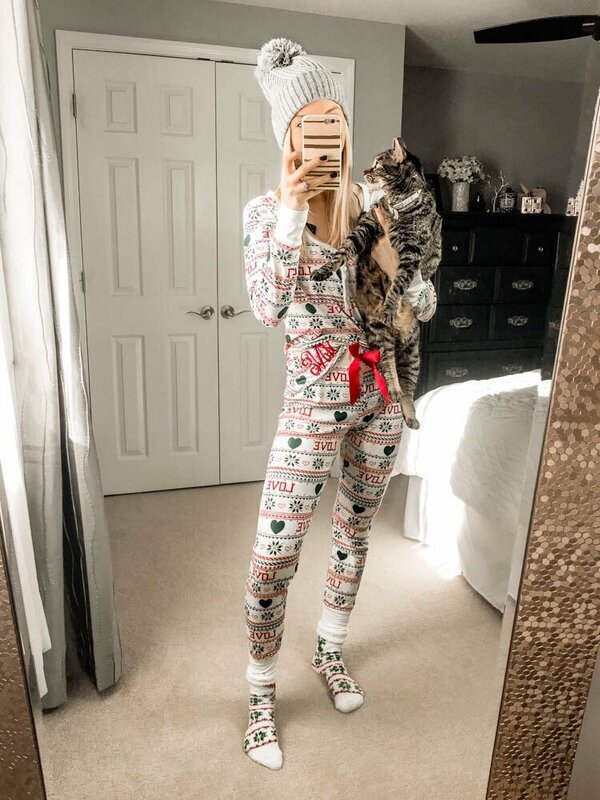 You can get the pajamas on their website here! Plus, they also have a really cute and warm, Christmas hoodie (also monogrammed) for just $10 right now! It has a cute little snowflake on the hood and says “Jingle All the Way” on the back. 🙂 You can shop for my beanie and favorite bralette by clicking on the pictures above. I’m also all about helping reducing stress in general, so I’m sharing 5 ways to not let holiday stress win this year below! Sometimes we can get caught up in thinking about what we don’t have during the holidays, and it can make us feel sad. Instead of focusing on those things, wake up every day and go to bed every night thinking about the small and big things you are thankful for. You might not have that perfect family dynamic or a bunch of money to get Christmas gifts, but all that matters is that God loves you. I always think about how grateful I am for my family, a roof over my head, food to eat, and so much more that I should never take for granted. Lots of people don’t have those things. I have had to learn this more and more over the years. I’ve always been pretty good at setting boundaries and saying “No” when needed, but it’s a lot harder when it comes to family. I get really anxious about hurting other peoples’ feelings, but your mental health is more important. Don’t try to make a million stops everywhere around the holidays (unless you enjoy doing that). Set a limit to how many places you will go, and try to lower your amount of holiday stress. Come up with a specific plan about what you are doing and stick to it. If a bunch more people ask you to come over, just let them know that you wish you could, but you already have other set plans. You don’t want to spread yourself and your family so thin that you don’t even enjoy the holidays. People who truly care about you and aren’t just thinking about themselves will understand. This is a hard one. If there is something or someone that makes the holidays unbearable for you, you need to find a way to take care of the situation. You can always be kind AND also not be a doormat. We all have our own stressors in life, and we all have to find a way to take care of them in the best way possible. Do not let them linger on and constantly cause you anxiety. If I found out that I was causing someone anxiety, I would want to do whatever I could to fix the situation. People who truly care about you and your happiness will understand and try to work out whatever the issue may be. I wanted this to be last, because it really is the best reminder for you to get rid of that holiday stress. This time of year is not about the gifts, and it’s not about worrying which family member you are going to upset. We all know that Christmas is about the birth of Jesus. It is a time to be thankful. We all want to focus on being the best versions of ourselves that we can be during the holidays (and really every single day). Are you creating a happy atmosphere for you and your family (if you’re married and/or have children)? Are you being kind to others? Also, you obviously want to make other people happy (after all, it is the season of giving), but there is a point where it can become an issue. If it comes to a point where you are only focused on and anxious about materialistic things or what someone else wants, then you are losing the true meaning of Christmas. Make a change. In short, focus on what is important and let everything else go. You and your family will thank you for it. So don’t let holiday stress win this year! 🙂 I hope you have all been enjoying these kinds of posts, because I really enjoy sharing them! To read my previous post about “5 Little Ways to Be Cheerful During the Holidays”, just click here! I will talk to you all soon! This entry was posted in Fashion, Lifestyle and tagged Christmas pajamas, Christmas socks, Christmas stress, fuzzy socks, holiday pajamas, holiday stress, how to deal with holiday stress, how to deal with stress, monogrammed pajamas, monogrammed pjs, pajama set, pajamas, pjs, stress, Winter pajamas, Winter pjs, women's pjs, womens pajamas.